As an indication that Philip Abadicio is indeed a lifestyle practitioner, the preceding paragraph mentioned the word “lifestyle” 8 times. He adds color to the viewing experience with his new TV show that has brought out the friendlier and more amusing side of his personality as captured on-cam in his latest quest as Philip, Lifestyle Guy. Philip Abadicio is no stranger to the various lives and styles but like most people, he began with a humble venture that led from one thing to the next. Who knew that his destination would be a show on TV5? After graduating from U.P. Diliman, he opened a retail store called Wild Life at the newly-opened Robinsons Galleria. Wild Life was a clothes and knick-knacks store that specifically catered to the lifestyle of the urban wild. It was an interesting concept at that time that it caught the attention of daughter of the owner of the mall. Through Wild Life and his inquisitive nature, Philip has laid the foundation of determining the next big thing. 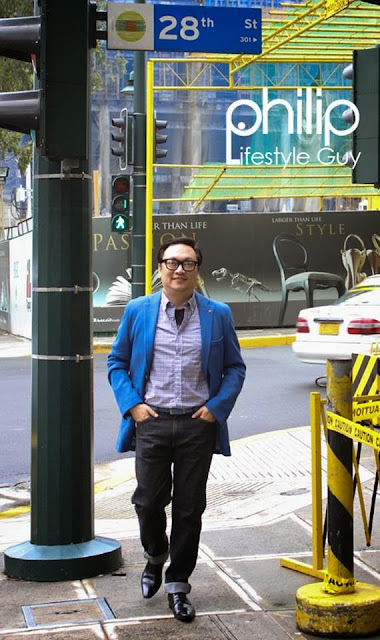 Encouraged by the same mall and Manila Times owner to pen lifestyle write-ups, Philip was faced with opportunities to create his niche as a lifestyle figure. Philip wrote typical lifestyle themes: fashion, food, finds and Manila’s fabulous through his column Flip Flop at the Manila Times. Eventually, it would become a source for trend metrics that identified the Flip (in) and the Flop (out). With his growing network and connections in Manila’s In and It crowd, Philip capitalized on his professional standing and established a PR agency, RPA. He began with clients like Euphoria and Levi’s. As Philip continued to spot the trends with more brands and services for young adults, Philip brought Bacardi, Nickelodeon, AXN, Yahoo, Warner Music, Pizza Hut and a lot more, a younger and fresher branding to their target market. Philip utilized his know-how in singling out what’s in fashion and who’s the up-and-coming which fueled his position as a PR authority. He partnered with Paolo Bediones to expand his PR machine and set up Communicate, one of the agencies that handled trend-setting campaigns that targeted lifestyle, and hip and young brands. As his partner became busier with TV assignments, Philip incorporated the PR firm into RPA & Communicate and the roster of clientele included Hennessy, MTV, Ericsson, Dockers and Studio 23, among others. Philip maintained his stance in Manila’s social scene. He organized creative events and parties for Moet et Chandon, Standard Chartered and Dom Perignon, and many other prestigious brands. His campaigns were also a platform for famous celebrities today, such as Pia Guanio’s stint with Caltex as a weather girl, and her team-up with Paolo Abrera to participate at an AXN event in New Zealand. True to Philip’s nature as a lifestyle pundit, and together with Paolo Abrera, the two launched a free magazine called ZERO, which listed the happenings within Metro Manila. Philip would later create FLY magazine with Levi’s and after six years, the magazine would be published and circulated in Hong Kong. Philip also briefly dabbled on talent management. It was inevitable that through his work and connections, Philip would have a peek at the interesting world of entertainment. He initially discovered the talented Rico Yan, whom he would introduce to Johnny Manahan and ABS-CBN. Afterwards, as they always say, the rest was history for the young actor. With his background in producing content and events in the world of lifestyle, trends, celebrity and society, Philip was encouraged to join the world of entertainment. He hosted lifestyle news program for Destiny Cable’s Global New Network. He also produced the show Follow for 2nd Avenue in 2012. Despite the persistent opportunities to take on the reins as a local lifestyle maven, Philip decided he wanted to do a show that is accessible across many viewers, across typical demographics. And like an answered prayer, and a sign on the road, he was offered to do a lifestyle talk show on Aksyon TV in order to reach out to more people. It’s More Fun with Philip, a magazine and talk show on TV5’s news channel, was a hit. After several interviews with interesting personalities and features on fascinating establishments and locations, a whole new road was being paved for Philip Abadicio. Philip – Lifestyle Guy is directed by Dave Hukom and produced by Yanna Acosta. It airs on TV 5 every Sunday from 11 a.m. to 12 nn. Set to provide more fun, information and entertainment to your TV viewing experience, get ready to travel Metro Manila and other parts of the country with style, as lifestyle guru Philip Abadicio shows you how to celebrate and live a good, happy and stylish lifestyle, whatever status, situations and circumstances you have right now. You can also find out about the contests, winners and other announcements on their social media accounts: Philip Lifestyle Guy on Facebook, @LifestylePhilip on Twitter and @PhilipAbadicio on Instagram.